Oldenburg, Claes. Poem 1 and Poem 2. Penny Poems, No. 31. New Haven, CT: Penny Poems, 1959. Single-sided sheet, 8-1/2 x 11 in., toned with losses at two corners; typed-signed at bottom, Claes Oldenberg [sic]. 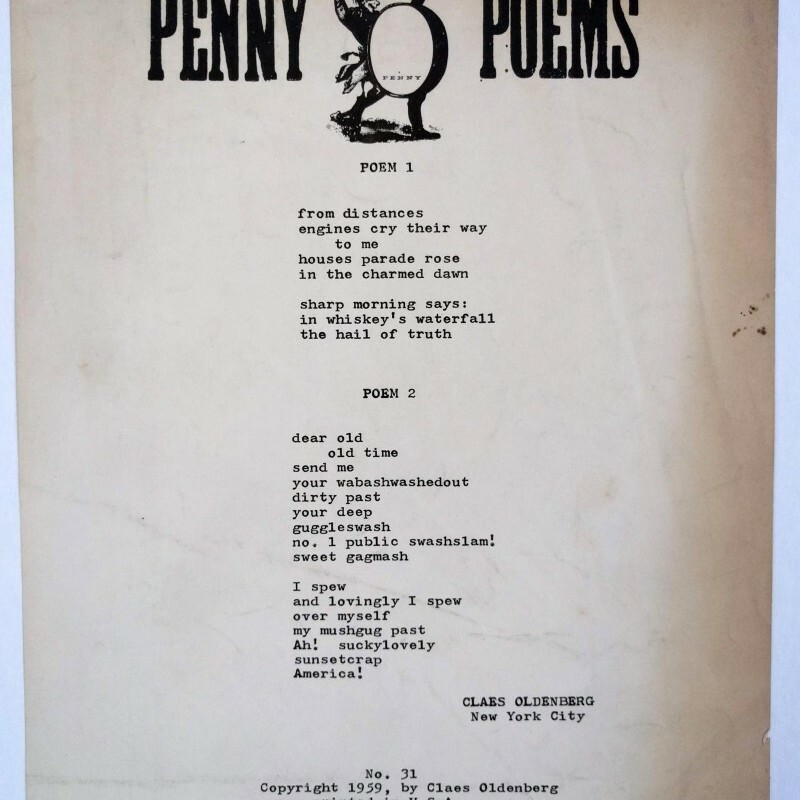 Scarce issue of Penny Poems, the daily broadside poetry series founded by Yale grad students in 1959. It was sold at various bookstores for 1¢ and published early work by a number of famous language poets and Beats including Amiri Baraka (LeRoi Jones), Diane di Prima, and Ron Padgett. This would appear to be the first published writing by Claes Oldenburg, whose poetry based on found imagery was the subject of a 2012 exhibition by at the Menil Collection, Houston, entitled Strange Eggs: Poems and Cutouts, 1956-1958. The exhibition focused on a transitional period in his artwork, shortly before he made his first iconic Pop sculptures. The humor and absurdity of the “collage-like” poems are evident in these examples. OCLC records only one holding: Brown; a copy may also be held at Yale.